I almost forgot about this post, you guys, since these holiday days are running together. But here I am. Notice the number up above. ONE HUNDRED AND NINETY-NINE. I am not even making that up. Next week, the first Sunday of 2011, we’ll all be kickin’ it 200-style. Two hundred weeks of taking some time here at 7-Imp to reflect on Seven(ish) Exceptionally Fabulous, Beautiful, Interesting, Hilarious, or Otherwise Positive Noteworthy Things, whether book-related or not, that happened to you. Whew. Pretty neat timing, huh? I’m going to forego seven separate kicks this week (by all means, leave your seven kicks, though) and simply say hi and, once again, happy holidays. I’ve been short-and-sweet posting some holiday illustrations this week, one for each day, thanks to some nice illustrators, so if you missed ’em, go have a look. Today’s illustrations are from the one and only Julie Paschkis, who has graced this blog many a’times, seeing as how I’m a huge fan. My one big kick right now is that I get to see some dear long-distance friends this week, and that includes Eisha, who’s in town. Yes, seven woots for a girls’ night out, as we plan to hit the town one night this week, have a generous amount of wine (that’s my intention anyway), and catch up. How about you? Did you kickers have a wonderful holiday? I hope so. Here’s one more image from Julie, and I thank her for sharing her art this morning. Images copyright © 2010 by Julie Paschkis. Reproduced by permission of the illustrator. I hope you had a wonderful Christmas, Jules! I look forward to seeing all the fabulous art and stories you’ll share with us in 2011!! 1) Happy holidays to all! 2) On Monday, I’ll be recording songs for a new musical. I’m very flattered to be asked, and very excited to sing on the demo. 3) I gave an apple to a raccoon. 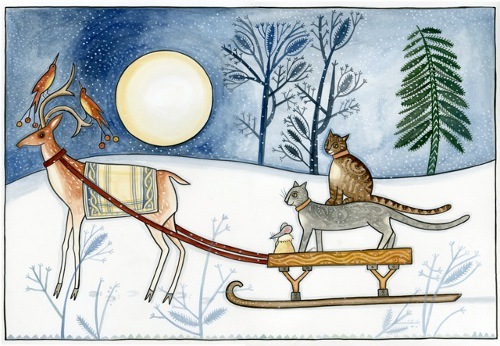 Paschkis art: The little mouse in the collared coat, the folksy textures in the cats’ fur, the cool winter palette – love it. Jules – on the verge of 200! Hats off to you! It’s a joy and honor to participate in your rich, thoughtful and beautiful-mage-filled blog. LW – the queen of the concise list! Good books (yes!) key common ground here. I adore raccoons and envy your encounter. (Congrats on recording!) And see? my comments are longer than your whole list! 4. my boys, young men, showing thought, humor, heart in gift choices. 5. Ah, ‘chocolate mint’ hot chocolate with just a splash of Schnapps. 6. books, books and more books to read in the New Year. Hope 2010 was good to you and yours; Happy New Year 2011! Little Willow, congrats on the demo! Very exciting. Break a leg. I know you will. Your last kick gave me a thrill. Denise, we will forgive your drunken typing. All that Schnapps. Hee. Man, I just added The Illusionist to the ‘ol queueueueueu. It has an “unknown” availability, but I’ll wait patiently. …Love kick #4. (Anyone who asked me what I wanted this year didn’t have to be thoughtful. I meant it when I said I wanted iTunes gift cards to get caught up on lots of music I talked myself out of buying this year.) Yay for your sons — and your husband, too. What books did you get, and thanks for #7 and the blog compliments! The blog is blushing. Jules, I love love love the art of Julie Paschkis. Our family had a wonderful Christmas Eve and a great Christmas Day. I’m so happy I live close to so much of my family and that we can get together for the holidays. Fortunately, the blizzard hit us the day after Christmas. I’m surrounded by a world of white. It hasn’t stopped snowing and blowing yet. Late fly-by kicks – but hope you all had a wonderful Christmas! Love, love, love Julie Paschkis! Congrats Jules on post 199! Hope your day with family was merry! 1. Christmas eve tradition of watching Love, Actually. 2. The peacefulness of house and animal-sitting. 3. Curling up on the sofa with a book for hours while it was cold and rainy outside. Merry merry, and happy happy! Hope everyone has a great week! Rachel, what rich kicks. I am jealous of kick #3. I need a really good novel. 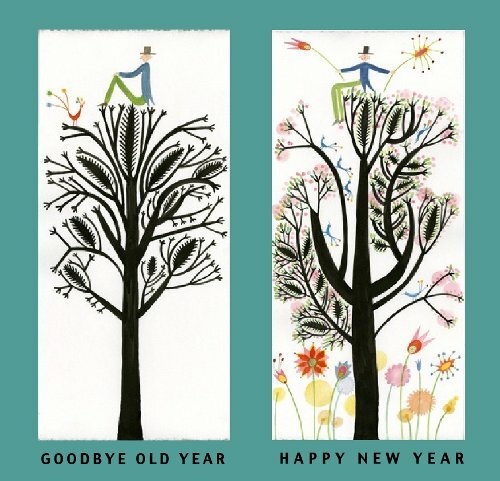 Happy new year to you! The artwork of Julie Paschkis is always a kick! I’m glad you get to visit with Eisha this week, too. Congratulations to Little Willow, too! 1. My mom’s in town. 2. My daughter has a new school to go to, and I believe the people there will be good to her. 3. My husband’s first art show was a success. 4. I finally have a healthy BMI. 5. My brother’s getting married. #4 makes me so happy, Farida. I know how hard you’ve worked. I get a physical every January, and for the first time in many years, when they ask me if I exercise, I won’t be muttering, “I can’t seem to find time.” I’m looking forward to it in a weird way. I’m also excited for your daughter’s new school adventure. It’s also a kick, yes, when you know you have enough. p.s. Congrats to your brother, too…. Melinda, I don’t think so, but I’ll ask! Melinda, Julie says none of these images has any book or other connection. She was just inspired by winter—and the black branches against the sky, she said—and painted them. Funny how those animals (any animals?) can look so happy even without any expression on their faces. Here I’ll go off-topic if I may to alert folks that if you google Al Franken/Huffington Post there are two good stories about the FCC making alarming rulings that would affect websites like this one regarding net neutrality. Corporate websites should be banned from “priority pricing” that lets them buy the fast lanes on the Internet, leaving us in the slow. We need a Paul Revere community of independent bloggers so we can alert each other to crucial upcoming FCC rulings and make our voices heard. Farida: WOO HOO! Congratulations on all counts. Yay for you and your healthy, happy family. Denise: Thank you! The raccoon was so cute. Jules: Thanks. It’s all in the punctuation: What’s next! vs. What’s next? Elaine: Stay warm, stay dry, and stay safe! Rachel: Many good performances in that film. Thanks! Shelley, thanks for the heads-up. Little Willow, I know you’ll make the most of whatever’s next. I have no doubt.